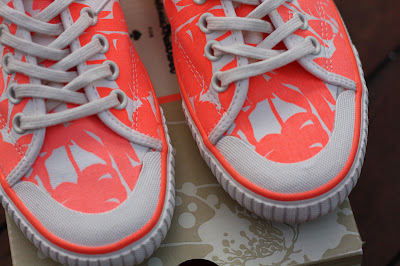 I'm reluctantly selling these cute US size 7 Kate Spade New York sneakers with Florence Broadhurst cockatoo design. I'm a size 8 and they are just too small. They are Summer 2012 limited edition and you won't find them in Australia - I had to have them shipped over by family. Brand new with tags in box. Head over to eBay if you're looking for a bargain. Did I mention that they are NEON orange?!?! Wishing them to a loving new home. Tempting especially being so close for pick up but I think I might struggle with the size too. Oh they are to die for you poor thing! Thanks to children they wouldn't fit me anymore sob!